Hello friends!!! I am so excited about today’s post! If you have been following us from the start than you know that we are very budget-conscious here at Pretty Providence. We pride ourselves on being smart financially and putting first things first. Well, I have been married for almost ten years, and up until now our main living area was made up completely of hand me downs and thrift store finds. Don’t get me wrong, you can find great pieces at a thrift store, but these weren’t that. The whole space was born out of necessity and not love. And that is fine! There is a time and a place for everything and I am proud of myself for keeping all that crap for so long! Haha. 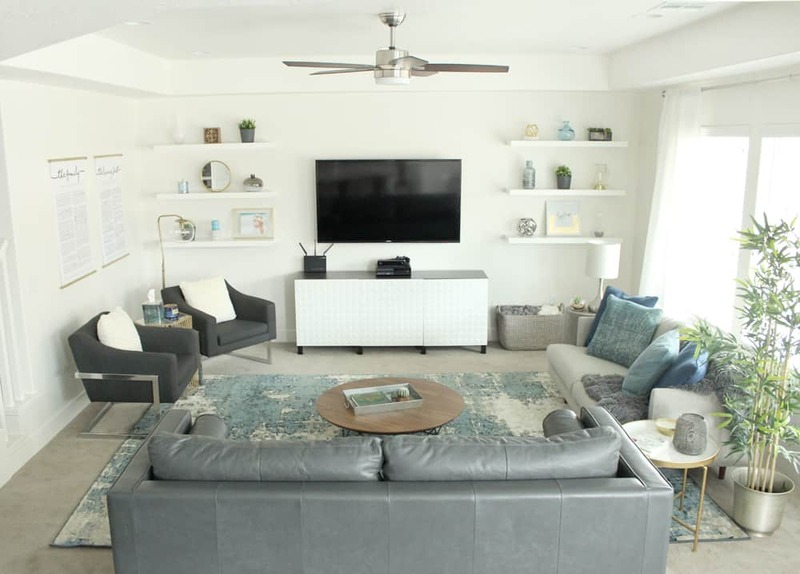 It has been a bucket list item of mine for years to design my own dream living room from the ground up and make it a reality! 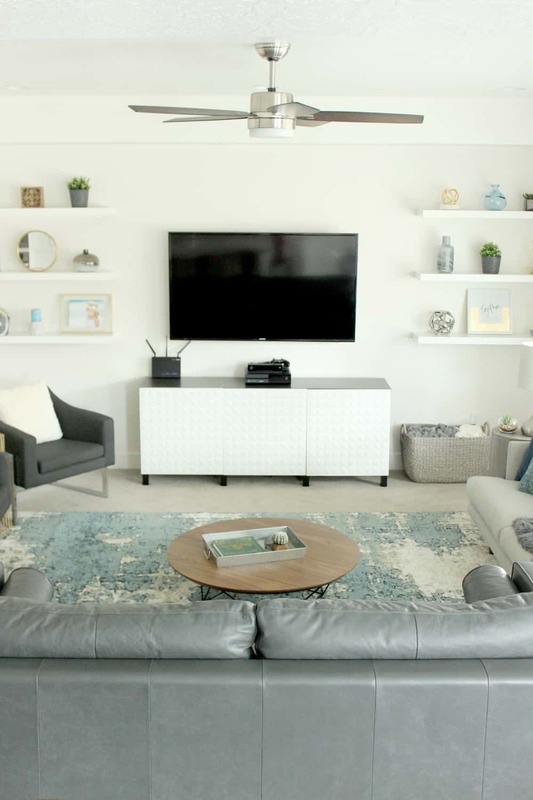 Well, it’s finally reality guys and I am so in love with this cozy modern living room space! Plus, the best part is the entire room start to finish cost less than $5,000! That’s for great quality, long lasting pieces, too! You ready for the tour? 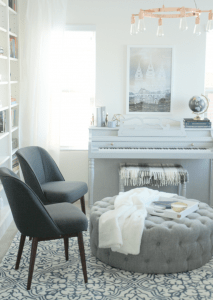 The whole room was sort of built around this beauty– the Sven Sofa in Oxford Gray from Article, because it was the first piece I knew I wanted in the space. 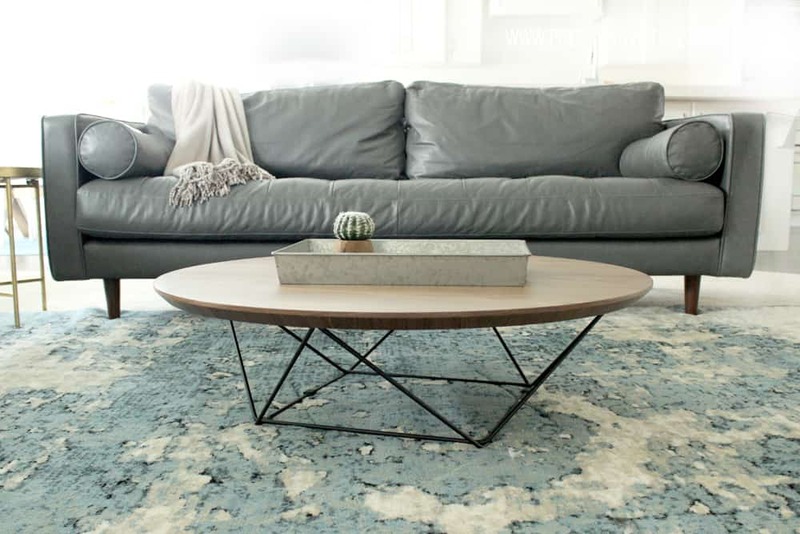 I found Article via their instagram and quickly fell in love with their gorgeous mid century modern and contemporary pieces. The photos painted a picture for me of beauty paired with comfort and functionality. I loved that the Sven was made out of leather, because lets face it with three littles in the house I need something that is wipe-down-able for our main space. Not only that, but comfort is a requirement! 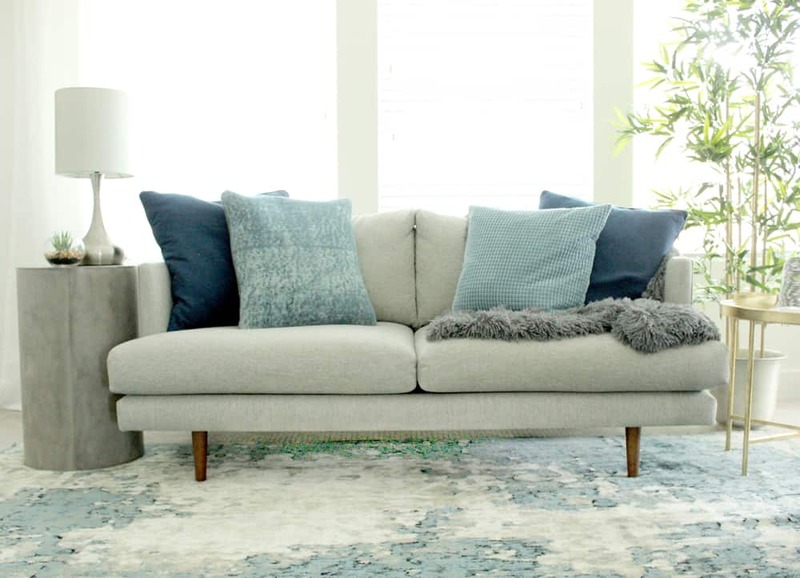 The Sven is the type of couch we can all cuddle up on and watch a movie, with a soft but firm bottom cushion and plush cozy back cushions and pillows.. it’s perfect! 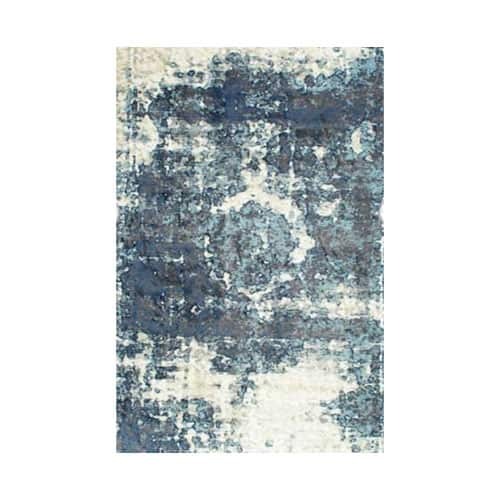 The gorgeous distressed medallion rug was the next piece that I knew I wanted, so the whole vibe was created around those two items! 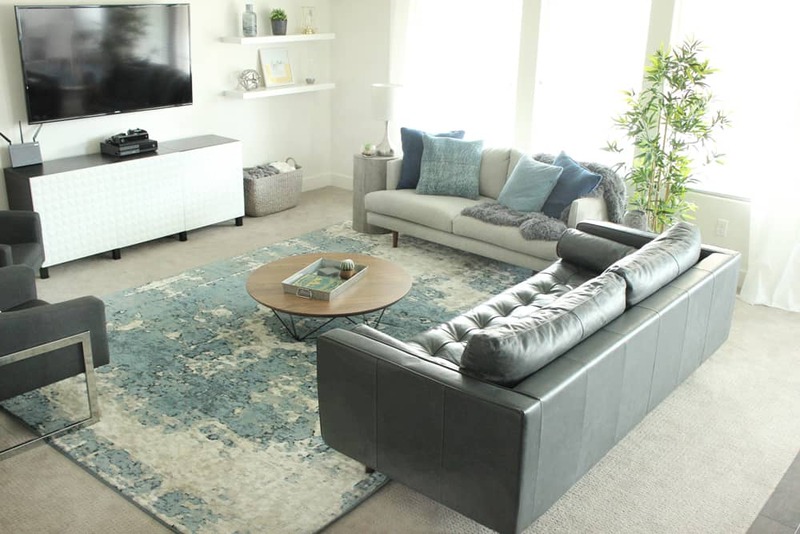 While I wanted the main staples to be very neutral (the couches, and coffee table) I like to add some color and variety through rugs and accessories! 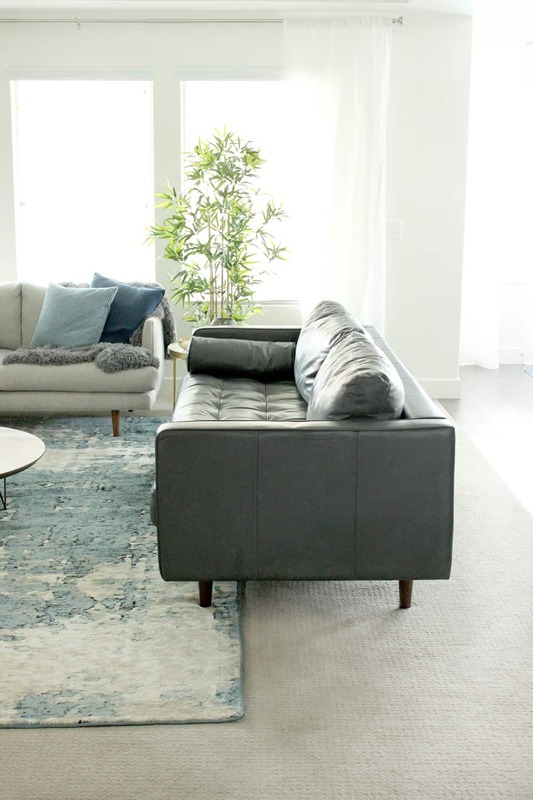 Then if in a few years I am sick of the blue, switching out a rug and some pillows is easy and inexpensive! For now though I am loving them! 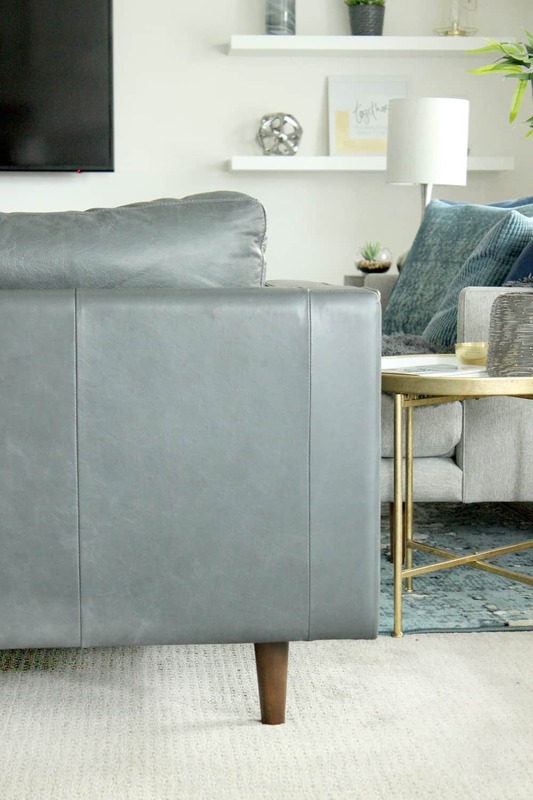 So this couch is a funny story… I actually had purchased a different cream colored couch online for the room, but when it arrived I was just super disappointed with its quality. 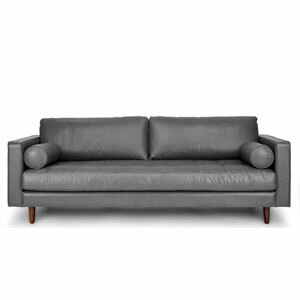 Especially sitting next to my perfect Sven sofa… haha. Even my husband (who never cares about this kind of thing) kept commenting on how crappy that couch looked next to the other things in the room! 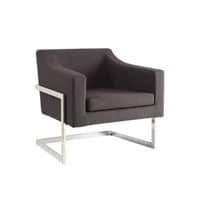 So, long story short we went back to Article and found the Burrard Loveseat in Seasalt Gray and ordered this one instead! 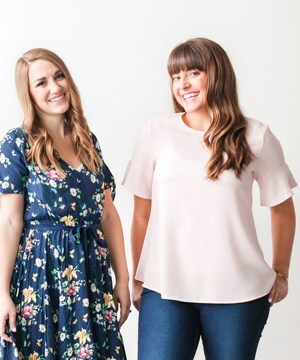 Article is able to keep their quality high with super reasonable prices because they don’t have brick and mortar stores- by operating online they cut out the middleman and save consumers a ton of money, for which I am grateful! The Burrard was barely more expensive than the first loveseat we bought, and the quality difference is honestly astounding. Here’s a side view of the Sven! The plant and the Vivan curtains are both Ikea finds! My sister found these pretty navy Heath armchairs for me and they are the perfect chair for that spot! You can see from this view how the living room opens up into the entry way as well. Here is a side view of the whole space together. 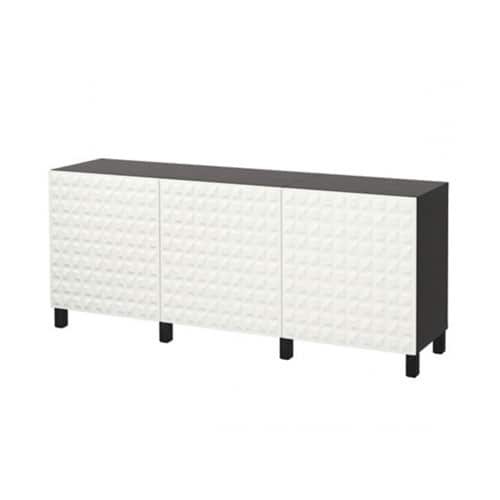 The “TV stand” is just a Besta storage combination from IKEA, which is tons cheaper if you buy it in the store, btw! These Proclamation to the Family and Living Christ prints are from the etsy shop PrintItEngineer and I love them so much! 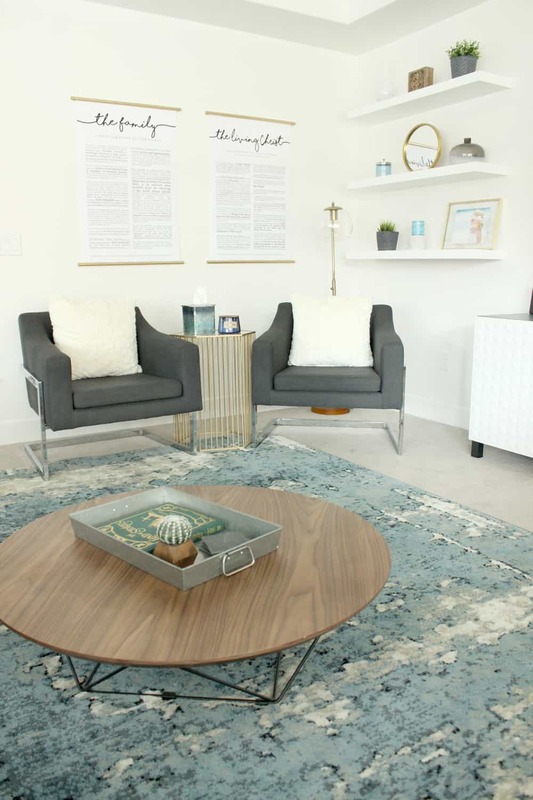 The cute side table between the chairs is from Urban Outfitters, the floor lamp is from Target, and the accessories are from Home Goods! 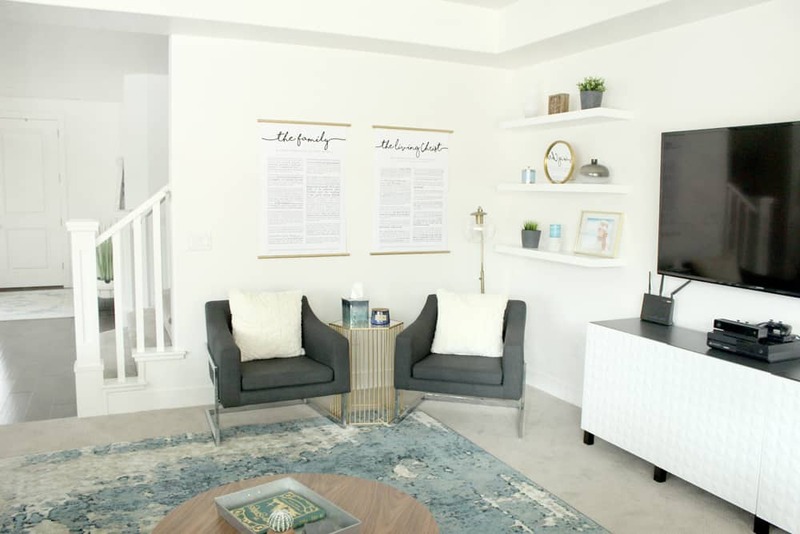 I mentioned before how I wanted the room to not only be pretty, but functional as well. I don’t know if it’s just my family but we are kinda obsessed with throw blankets… like, everyone must have their own at all times! Haha. 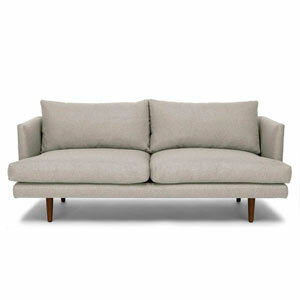 Also, I forgot to mention one of my favorite parts about the Sven Sofa is the single, bench seat cushion! No slipping in between the cracks! For people or crumbs… #momlife. Since I already had art on the opposing wall I went with shelves on the walls on either side of the TV. 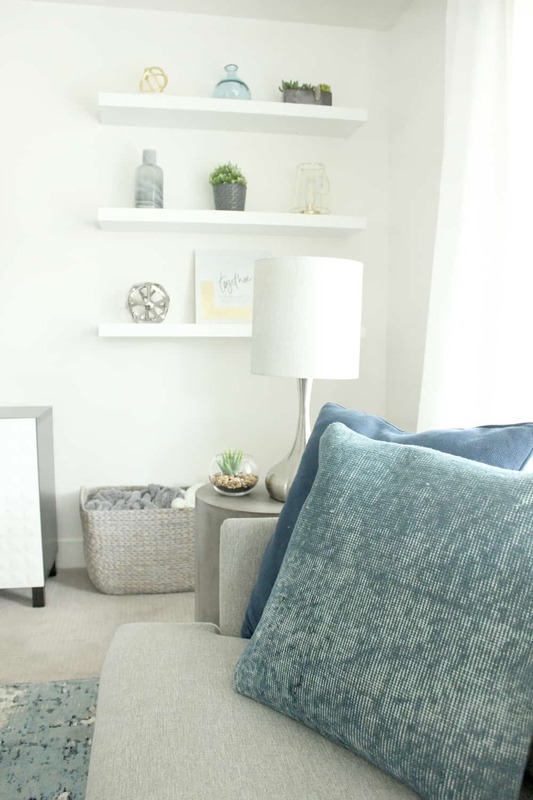 These Lack shelves from IKEA are so affordable and fun to style! Most of the little decor items were found at Michaels, Hobby Lobby, Target or Home Goods clearance sections.. respectively! 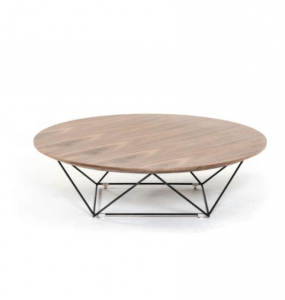 I love the warm walnut tones and pretty spokes on this Modrest Coffee Table! The table is pretty low and so it doubles as a foot rest for us when we want it to! FYI, for those of you who are interested, there is a “shop this post” table at the bottom of the post with all the links in once place for your convenience! 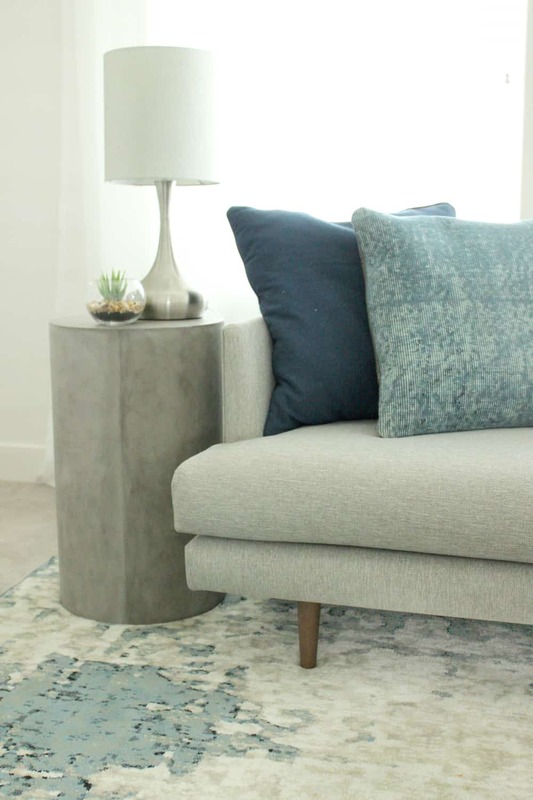 Loooooving this gray column side table! 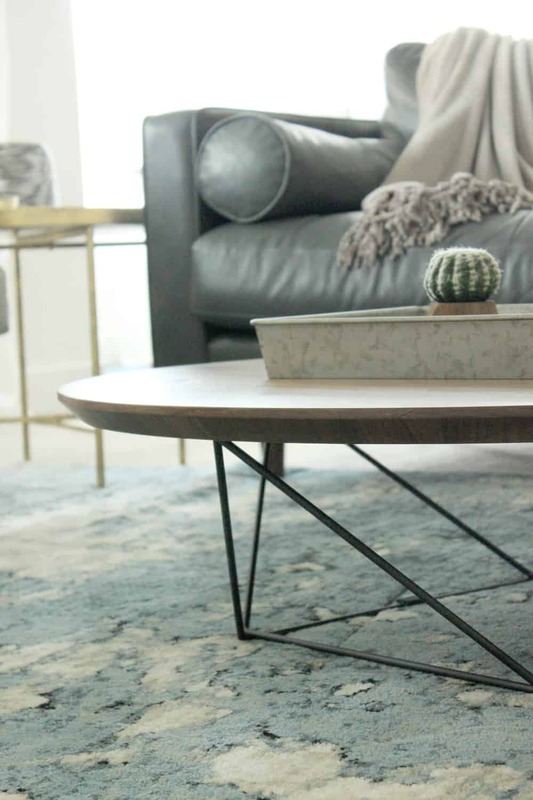 Up close on the spoke detailing… also, how cute is my little cactus baby?! He and the tray were both found at Target! Note the basket FULL of throw blankets in the top right corner! Haha. So, what do you think?! What is your favorite piece in the room? Hi. 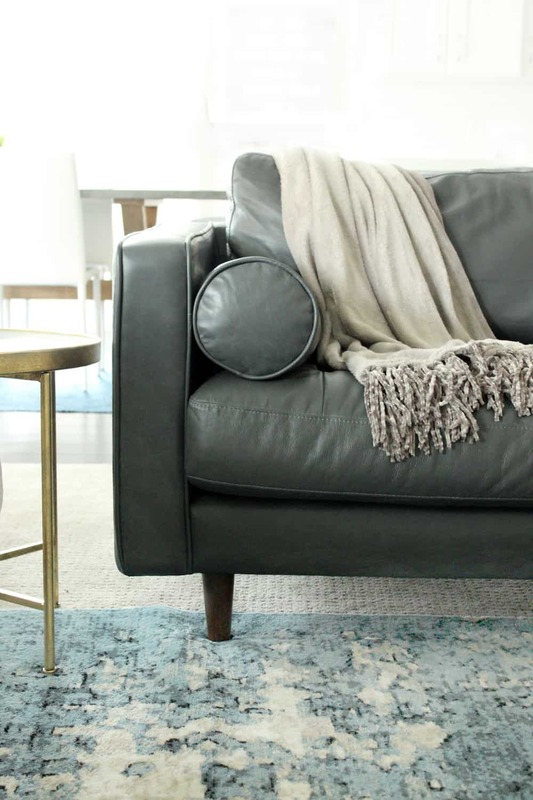 Can you tell me how your Oxford Gray Sven sofa has held up over time? Are you still happy with it? Thanks! Hey Michelle! It has held up great with four kids! There are no scratches or tears, and its so great to be able to wipe down and sanitize the leather! I will say though, that we don’t love cuddling up and watching movies on it. It’s great for entertaining company etc, but if you are snuggling up to watch a show I prefer something with more cushion and a higher back. I hope this helps. We still use it and love it every day, just kinda depends what area you are looking for! Thanks so much for your response. I am struggling trying to make the decision, because I love the look and the price of the Sven so much. 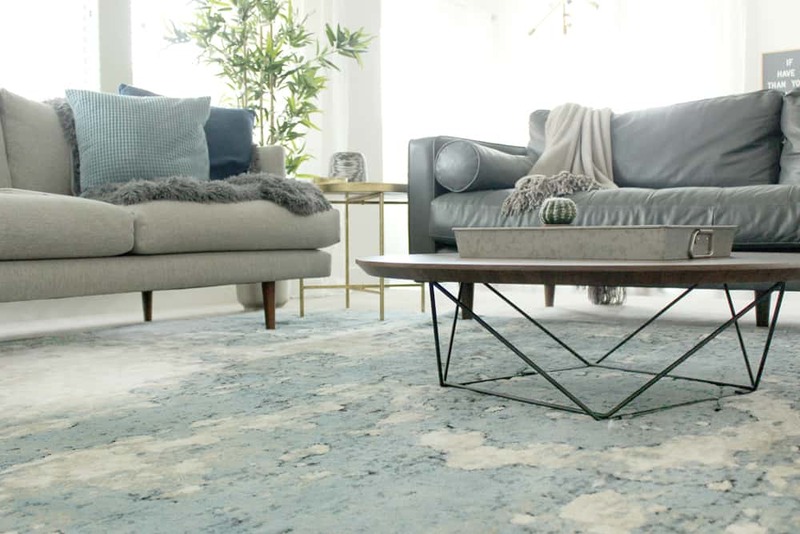 It seems that if I want a more modern style, the back will be lower and perhaps less “snuggable” than our current Pottery Barn-style sofa. The struggle is real! I appreciate you letting me know it has at least held up well thus far. I am in love with the entire look of your space. 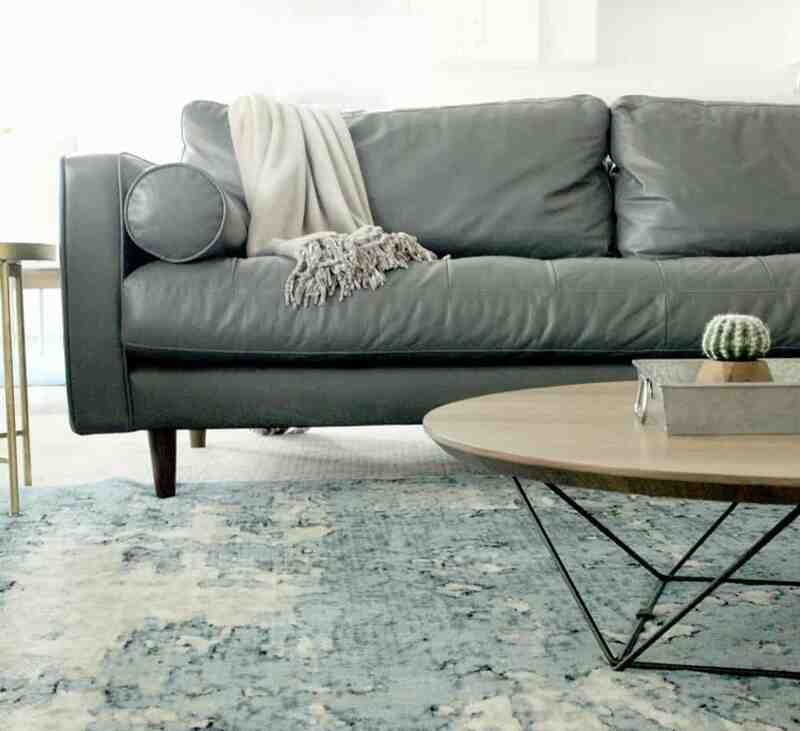 Blues are my favorite colors, and I’ve been trying to decide between a gray sofa or the camel color. I wonder if purchasing the Sven with the lounge end would up the snuggability factor? Thanks! To me it is more of a beige gray but it has held up great! We actually think it is more comfortable than the Sven over time! You can definitely see spills and stuff more on a fabric couch but it has cleaned well when our kids have spilled on it! I hope that helps! 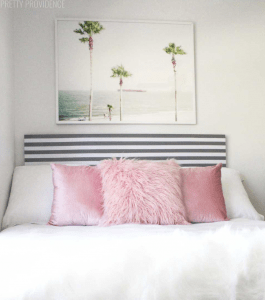 The room is fabulous on a budget!! It was a pillow cover I found at IKEA! 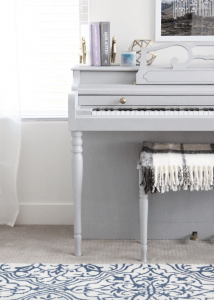 The room is fabulous on a budget! Bravo! I think the rug is my favorite. I am a big fan of blue. aww you just totally made my night! thank you so much!! i am obsessed with the rug too! glad you love it. Gorgeous! I’ve been eyeing pretty much everything on Article too. As soon as we are out of the crappy hand-me-down furniture stage I’m making a beeline to their site! Haha I totally feel you girl!! There stuff has been amazing for me so far and so well priced!